"Yikes! It's 2013 now! What about all those poor polar bears?!" Don't worry. The bears will be just fine. 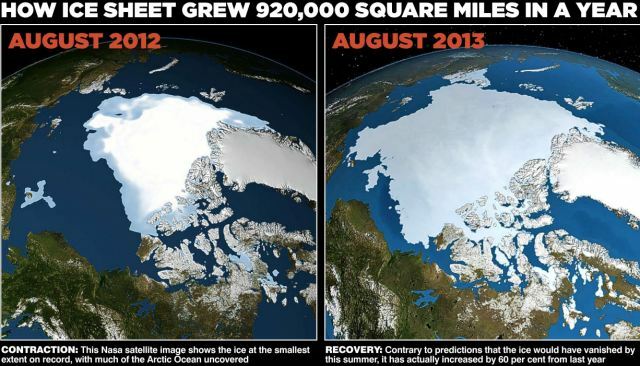 Mail Online reported on Saturday that the Arctic ice cap has actually grown larger. In fact, it is nearly one million square miles bigger than it was this time last year. That's a 60% increase in 365 days. Looks like some scientists will be frantically scrambling for more grant money in the coming months. To those who have been paying attention, this comes as no surprise. Global temperatures have remained steady for the last decade-and-a-half. Even the climate scaremongers at The New York Times can't ignore the obvious. Is it any wonder why the term "global warming" has since been replaced with the more ambiguous "climate change"? So cheer up. Waterworld is still the stuff of science fiction, and Greenland won't be turning green again anytime soon. Perhaps it's time for these Chicken Little climatologists to simply chill out. Sure. No manipulation at all on the part of the "climate change" crowd. In the meantime, we've all been enjoying steady global temps for the last 15 years, despite all the doom and gloom about man-made greenhouse gas emissions.